The “Cold War” between America and Russia was heating up. And with world leaders demonstrating their “power” to each other, with ever increasing tests of nuclear bombs, they were also creating consequences they couldn’t conceive. For while a nuclear test in Russia may seem to have nothing to do with an auditing session in Florida, when L. Ron Hubbard discovered there was a link—he acted. That is, quite in addition to its obvious physical effects, radiation was slowing processing and clearing. Moreover, it wasn’t just in the geographic locale of nuclear tests, but virtually planetwide. What followed was the call for an “Emergency Congress,” in a location that couldn’t have been more appropriate—the Hall of Nations in Washington, DC, overlooking the White House itself. Whereupon Mr. Hubbard first unveiled his research to find any means of addressing the effects of radiation on the body and his discovery of startling effects of nicotinic acid (niacin). Here’s the full story of what he described as the “educated” vitamin, and the original breakthrough that underlies the technology of the Purification Rundown. Even more, here is the greater story of radiation as not just a present-day problem, but an aberrative factor in practically every incident on the whole track. From that revelation came a flood of breakthroughs applicable to virtually all of life—from the bottom-line solution to psychosis, to new technology for raising a being on the Sub-zero Tone Scale—capable of confronting anything. And that’s just a glimpse of what this Congress contains—bringing solutions to problems as old as time itself, and as current as today’s headlines. By the mid-1950s, American nuclear testing had loaded North American skies with alarming levels of radioactive dust. And nowhere was the fallout heavier than in and around the Nevada desert test sites, where literally hundreds of explosions lit the skies across several states. In point of fact, just a few hundred miles to the south, in Phoenix, Arizona, L. Ron Hubbard spoke of everything registering “hot” on a radiation-detecting Geiger counter. Vegetation, livestock, even the piano in his living room—all of it buzzed with minute radioactive particles. Even more to the point, Russia was conducting her own nuclear tests and it had now become a race with America as to who could build the most and biggest bombs. All of which meant that radiation was spreading everywhere. Yet despite the escalating numbers (atmospheric radiation levels were routinely printed in newspapers), virtually nobody was talking about the dangers. Much of the public were oblivious, even attending parties—with no protection except a pair of sunglasses—to “experience” the resultant flash of a nuclear explosion taking place but a few miles away. As for those not so unconcerned, it was all a mystery, with paranoid governments hiding behind a shroud of secrecy. “1. Are my family and friends alive? “2. Is the Federal government still functioning? “3. Can I buy anything with the money in my pocket? Is it still good? “4. Where will I get water to drink tonight? “5. Will I have anything to eat tomorrow and next week? “6. How can I help others? “7. How can I get even with the men who launched these bombs? “8. Can America live now? “9. Can anything be salvaged in all this chaos? “10. How can I get work? Yet even while that project continued, so did Mr. Hubbard’s researches. And when they all of a sudden included a groundbreaking discovery of truly global urgency, the call went out for an “Emergency Congress.” Washington bound chartered planes were soon hopping from city to city, collecting Scientologists en route. As for where they assembled that Sunday—29 December 1956—the location couldn’t have been more appropriate: Hotel Washington’s Hall of Nations, on Pennsylvania Avenue and overlooking the White House. “Somebody blowing up a bomb over here in Russia has nothing to do with you processing a preclear in Poughkeepsie, does it? No. Nothing at all to do with it. That’s simple. That must be a very disrelated fact. The rate of clearing of a preclear in Orlando, Florida has nothing to do with atomic fission, does it? Then, delivering three lectures and two Group Auditing sessions that first day, he unveiled his discoveries that addressed the immediate threat. Here was Dianazene, a compound of several vitamins, so named in reference to its ability to handle effects on the body in a Dianetic fashion. And what he was specifically referring to was one of the vitamins contained in that formula, nicotinic acid (niacin), and his discovery of its remarkable relationship to radiation—capable of making the body flush red in the exact pattern of past sunburns. 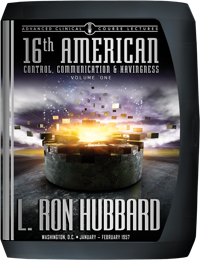 Yet no matter how legendary that discovery has now become on modern-day Earth, the discoveries Mr. Hubbard further revealed were truly universal, extending across eternity itself. For that is the real history of radiation, not only extending back to a time when everyday objects provided their own illumination, but explaining both how and why radiation was an inherent factor in practically every aberrative incident on a being’s whole track. 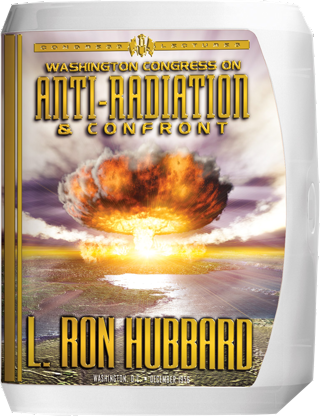 All of which also explains why research into the subject of radiation resulted in so many landmarks this Congress contains, from the all-encompassing breakthroughs on Havingness and Confront, to the most fundamental program to spread the answers of Scientology everywhere: Project Third Dynamic. And that is the story behind the first Anti-Radiation Congress, bringing solutions to problems as old as time itself and as current as today’s headlines.